One of the more prolific setters of recent years greeted us this week, although this was only his fifth Listener following on from Six Characters in Search of an Author theme last year, courtesy of Pirandello. An extra word in each of the down clues and extra phrases in six acrosses needed to be extracted. Themetically-placed letters in the down clues’ words would spell out something meaningful. 1ac Distracting translation in personal record (12) was relatively straightforward, but I didn’t get it! I tried 1dn Either date a risk, and we only had a choice of four for the extra word, and ‘either’ seemed likely giving DARE for the answer. Back to 1ac and DIVERSIONARY got the thumbs up this time. I-BEAMS, REVERT, ORACHE and ASUNDER dropping down from 1ac meant that I was up and running. 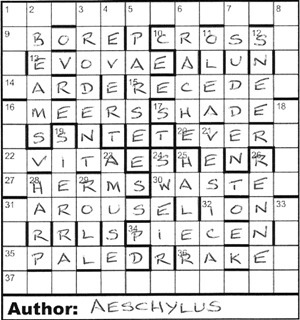 I went back for some across clues and 13 was EVOVAE and 15 Dubious creed abject Sun editor backed (7) seemed to give RECEDED, but ‘abject Sun’ seemed to be my first extra phrase intruding into the clue. It looked as though it might be an anagram, but of what proved problematic. Similarly, 17ac Shared mobile can be just for one who loads tones, possibly (6) didn’t seem quite right for SHADER. It took a few minutes for me to realise that ‘can be just’ was both superfluous and also an anagram of ‘abject sun’… or rather both were anagrams of something else. 20 The best possible start to enterprise? Extremely casual hope (5) had a superfluous ‘casual hope’ if the answer were to be EVERY. At this point, I’m afraid that a bit of anagram help seemed appropriate, and ACEPHALOUS for headless and SUBJACENT meaning bottomless seemed to be trying to tell me something. And so, after 45 minutes, I was well into the solve, and the thematic letters in the extra down words were obviously their heads and bottoms, and so far I had most of Erase some let…, and it didn’t take long to identify ters from grid, followed by Reorder to single words from words in the remaining down clues. This last bit told me what I already knew, namely that the superfluous phrases in the across clues needed to be unjumbled. From there on the grid was finished pretty quickly. The six phrases from the acrosses gave two APTERALs, two ACEPHALOUSes, and two SUBJACENTs. These mean ‘wingless’, ‘headless’ and ‘bottomless’ respectively. This reflected that all the entries could become new words if they lost the letter that strayed anywhere into the perimeter. It didn’t take long to see PROMETHEUS lurking in the main SW–NE diagonal with E and T filling the two barred-off cells. The two related works required by the perimeter were thus Prometheus Bound (Fast) and Prometheus Unbound (Loose), works attributed to AESCHYLUS who was promptly written under the grid. It thus became necessary to erase the letters of each entry that strayed into the perimeter. Indeed, with the meanings of the six phrases, the whole of the perimeter was erased, thus ensuring that the grid was headless, bottomless and wingless. Although this was a relatively easy puzzle from Ifor, it was nonetheless very entertaining as have been all his Listeners. Many thanks. This entry was posted on 22 May 2015 at 4:00 pm	and is filed under Solving Blogs. You can follow any responses to this entry through the RSS 2.0 feed. You can leave a response, or trackback from your own site.